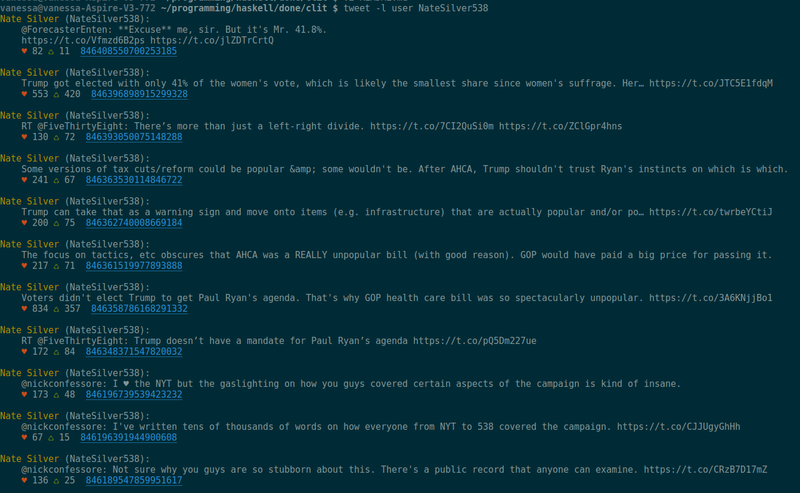 tweet-hs is a command-line tool for twitter. It has more features than its rust counterpart and it's a bit slower. You know haskell and like being able to extend your tools. You want a twitter library for haskell. You want "twitter in a terminal" that rainbowtools or oysttyer provides. If you're on Linux/Windows the best way is probably to download the binaries from the releases page here. Then type stack install tweet-hs it will put an executable called tweet on your path. To view a user's profile, type e.g. tweet send "This is my tweet"
To tweet from stderr, run a command that pipes stderr to stdin, i.e. to view your own timeline. The directory bash/ has a mkCompletions script to allow command completions for your convenience. A haskell package is included. It's fairly easy to use once you have the credentials set up, with two main functions: thread and basicTweet: the first for threading your own tweets or replying to someone else's and the second for just tweeting.